That means, "I have found it." My husband Chris was a "meat and potatoes man" before we went vegetarian three years ago and meatloaf was one of his favorite dishes. I've been searching for a tasty veg alternative since. 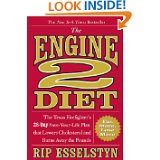 I found it in this recipe from "The Engine 2 Diet" by Rip Esselstyn. Esselystyn's book advocates a plant-based, vegan eating plan that he says "lowers cholesterol and burns away the pounds." It's hard to find a plant-based diet plan. Most offer only a few vegetarian alternatives at best. But, all the recipes on this plan are 100 percent vegan with no animal products whatsoever. By eating only plant-based foods, you'll miss key nutrients. Also, I was able to make this recipe from ingredients already in my fridge, freezer and pantry. All I needed was a block of firm tofu. If you're not a fan of tofu, don't worry. My husband is not fond of it either, but this recipe passed the taste and texture test with flying colors. Preheat oven to 375 F. Spray a loaf pan with a nonstick cooking spray like Pam. Saute celery, onion and garlic on high heat in a sprayed skillet for five minutes until tender. Remove from heat and cool. Mash the tofu in a large bowl. Stir in the vegetable mixture and remaining ingredients and mix well. Spoon the mixture into a loaf pan. Top with a layer of ketchup (this step is optional, but adds flavor and moisture.) Bake 55-60 minutes or until a toothpick inserted in the center comes out clean. Serve with an Engine 2 Basic Salad of lettuce, mandarin oranges and sweet red bell peppers.